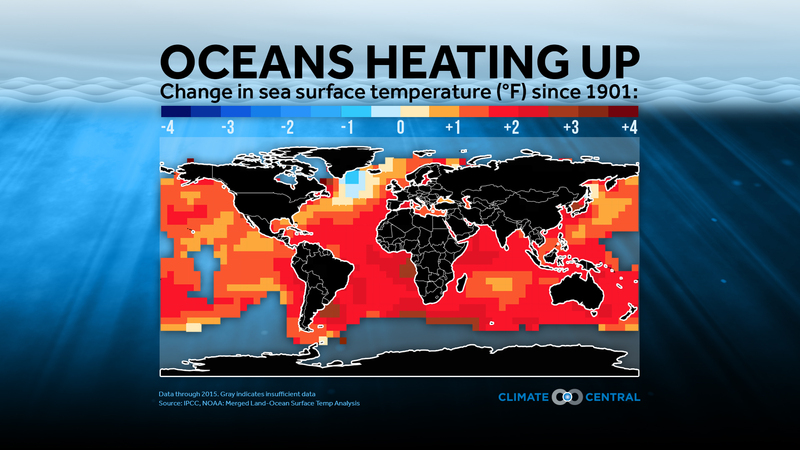 Earlier this week, scientists from the Scripps Institute of Oceanography corrected their most recent study regarding the ocean’s heat absorption capacity. This study, published in the journal Nature, initially reported that the oceans absorbed about 60% more heat from the atmosphere than originally determined. The scientists working on the study used a new method—collecting gases (mainly oxygen and carbon dioxide) that escaped from the ocean to calculate their amounts in the atmosphere. However, the scientists had not considered some “inadvertent errors” in these calculations, which suggested a degree of scientific uncertainty lower than what it actually was. (A more detailed explanation on the corrected errors can be found here). Though their conclusions align with other studies on marine heat absorption, this error triggered a tsunami of doubt on the reliability of the scientific evidence used to develop Climate Change policy. The ocean just recently got the attention it rightfully deserves. As a major carbon sink, we must pay attention to ocean health if we want to achieve the UNFCCC climate change goals. The Ocean Pathway, established at COP23, was a recent success to bring more awareness to the important role the ocean plays with climate change. The momentum from this looked promising for COP24, but can we expect a change in course? Science acknowledges that there will always be some level of uncertainty in scientific conclusions. However, developing policy demands the exact opposite—the tolerable level of uncertainty is set as low as possible. These two principles conflict when science is needed to develop environmental policies. How can we reconcile using data with uncertainty to create policy that operates without uncertainty? This issue is not new to international climate change regime. The ocean’s introduction into climate change negotiations resembles the path agriculture took only a decade ago. Several years ago, before agriculture made it onto a COP agenda, the Nongovernmental International Panel on Climate Change (NIPCC) released a contradictory report shortly after AR5. The IPCC’s AR5 reported a “risk of food insecurity linked to warming, drought, and precipitation variability, particularly for poorer populations.” The NIPCC reported the exact opposite, suggesting that global warming is actually benefitting farmers in Africa and Asia. Though the NIPCC introduced contradictory information to suggest scientific uncertainty with agriculture and climate change, the NIPCC—a nonprofit organization founded by the famous climate change skeptic Dr. Fred Singer—frequently uses their own “scientific analysis” to negate IPCC studies on global warming. This fun fact may have influenced the amount of reliance on this data in subsequent negotiations. There was also some controversy with scientific data cited in AR4. Apparently, the studies on African agriculture were “gray” literature, meaning that have not been peer-reviewed to ensure scientific reliability. Critics making this assertion claimed the same advantages of global warming for African farmers (also using “gray” literature, but that can be for another blog post). Yet, Parties were able to plant agriculture into the COP24 agenda despite the doubt skeptics tried to cast. The corrected Nature article on ocean heat absorption may have casted doubt on the importance of the ocean in the international climate change regime. But, if agriculture could survive the skeptics, the ocean can survive a miscalculation. This entry was posted in 1.5C, An Inconvenient Truth, carbon sink, climate change science, COP24, GHG reductions, scientific uncertainty and tagged ipcc, oceans, scientific uncertainty. Bookmark the permalink.